Cycle to Work Day saw thousands of people taking to their bikes, hundreds of events happening up and down the country and almost 500,000 miles pledged. Thank you for helping us make the day a great success! To help us build up a more accurate picture of the day, and to ensure Cycle to Work Day 2016 is even better, we'd really appreciate it if you could complete this quick survey. * 1. Did you have a free bike health check? * 2. 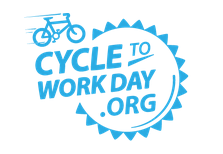 Did your employer run any of the following events in support of Cycle to Work Day? * 3. Did you cycle specifically because it was Cycle to Work Day? * 4. Did you enjoy Cycle to Work Day and the buzz around the day? What was your highlight of the day? * 5. Had you taken part in previous Cycle to Work Day's? * 6. How many days a week do you commute to work via any form of transport? * 7. What is the distance between your start address and your place of work (one way door to door)? * 8. How often have you cycled on your way to work in the past 12 months? 4 or more days per a week. * 9. On average, how many times a week do you travel to work using the following modes of transport?